AUSTIN, Texas — The eleventh Planned Parenthood expose’ video released by the Center for Medical Progress captures a Texas abortionist laughing about how obtaining an intact baby head would be “something to strive for,” and explaining how she performs breech or partial birth abortions to harvest the child’s organs. The investigator then states that he was told by Deborah Nucatola, Planned Parenthood’s medical director, that it is easier to harvest intact organs, including the baby’s brain, by turning the child breech. “I haven’t been able to do that yet—the intact calvarium,” Dermish replies. “It’s like, well, maybe next time, right?” the investigator states. The abortionist was also asked how intact the bodies were from the previous week, during which time her co-worker comments about the “cuteness” of the organs of the dead children. “[The 20-week-old baby] was trunk intact. They’re usually—what I’ll do— if it’s a breech presentation, I’ll remove the extremities first—the lower extremities—and then go for the spine and sort of break it down that way,” Dermish explains. “I always try and keep the trunk intact just by function of always trying to aim for the spine and bring it down,” she says. 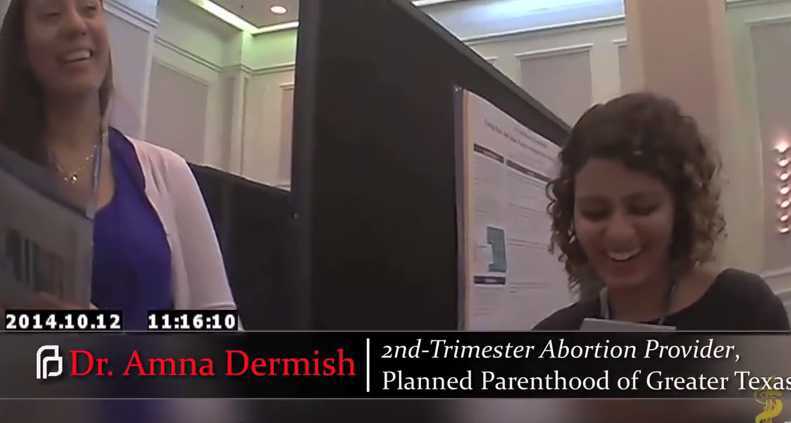 Dermish also explains that one of their workers is interested in organ donation and likes to look for the various body parts following the abortion procedure. “[S]he’ll pull out kidneys and heart, and heart we usually see at nine weeks and she always looks for it,” she says. The Center for Medical Progress states that it believes the footage is proof that the organization is performing illegal partial birth abortions, which were outlawed in 2003 under then-President George W. Bush.